"We believe that the family is the first and most important institution that the Lord created. Moreover, following God the family should hold the highest priority." -- Does this mean it is okay for me to think my family is more important than God’s family? It is not difficult to guess what my answer will be if you have read my previous posts on this topic. I would say, "No, it is not okay for me to think my family is more important than God's family. God purchased His family by the blood of His own perfect Son. The blood of God the Son produced a family that will live together forever. As a forever family, the members will always relate to each other on the basis of the blood of the Son, not on the basis of whether they share the same bloodline." This does not mean I should consider my family unimportant. Nor should you consider your family unimportant. And we are not free biblically to minimize, ignore or neglect our families. It is a matter of what is ultimate. God's family is ultimate. Our families are not. God's family is eternal. Ours are not. -- Marriage was intended by God from its inception to portray the everlasting union of Christ and His bride (Eph. 5:22-33). -- A person who does not provide for his family denies the faith and is even worse than an unbeliever (I Tim. 5:8). -- A man demonstrates his qualifications to shepherd the family of God by shepherding his family well (I Tim. 3:1-7). -- Jesus showed His love and concern for His mother by giving responsibility for her care to one of His disciples, even while suffering on the cross to rescue the condemned to be the children of His Father (John 19:26-27). May we sacrificially love our families because God has given us vital responsibilities to those whom He has placed in our care, but may we realize at the same time He has placed us in a family of fellow adoptees with whom we will worship Him forever. 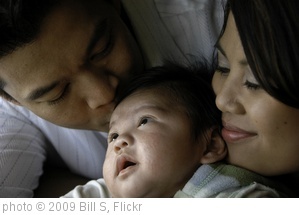 -- What does this mean for church members who are not part of a nuclear family [in the church]? Is their value less because they are only part of a church family and not part of a biological/adoptive family? Hopefully, no Christian would say the value of an unmarried believer is less than that of a married believer. Yet, espousing the nuclear family as the "most important institution" created by God and as the "highest priority" other than God may send that message. Even a church that would not affirm such beliefs can imply this by a constant focus on the nuclear family, by what is said in the pulpit, by the nature of the prayer requests shared, by the establishment and nurture of a culture that dwells on marriage while basically ignoring singleness. As others have pointed out, the church is not a family of families but the family of God. It is a family of equal members -- some married, some never married, some divorced, some widowed. The never married or otherwise unmarried are not second-class citizens. The married and unmarried all share the same riches in Christ. They are all joint heirs with Christ. There is no difference before God for those who are in Christ. And there should be no difference in standing within the church. They are all married to one eternal bridegroom, and they all -- whether married or unmarried on earth -- are part of the bride of Christ. One of the solutions offered by some family focused church advocates seems to be to make singles essentially members of nuclear families and thereby perpetuate the misguided idea of the church as a family of families. That should not be our goal as the church of Christ. Yes, we should welcome unmarried brothers and sisters into our families and homes, but our primary goal in doing so should be to make them sense they are full members of the family of God. As I have said before in this series of posts, Jesus created the church by His blood, not by the union of a man and a woman. By His work, He has produced a family that is not divided into the categories we so often dwell on but united in this reality -- we are all "in Christ." May it be so for us as we think about His church.